EC&M Electrical pty ltd was established in 1984 to sell ultraflex conduit systems from an Italian Manufacturer. The company is owned and run by an Australian family, with the profits staying in Australia. The last 25 years has seen the product range grow considerably in its scope. From the simple ultraflex conduit the group of products now includes rhino non metallic liquidtight, steel liquidtight, halogen free conduits, PVC free conduits, PVC cable trays, halogen free slotted ducts, cable cover and energy chain. Many of their products are still being produced by the same manufacturers they have been associated with for 25 years. EC&M offer high quality products at affordable prices, supplied through wholesalers and master distributors around Australia and New Zealand. As soon as Pulse updated the seven year old site, the number of enquiries and catalogue downloads increased considerably which no doubt helped to multiply the client & business. 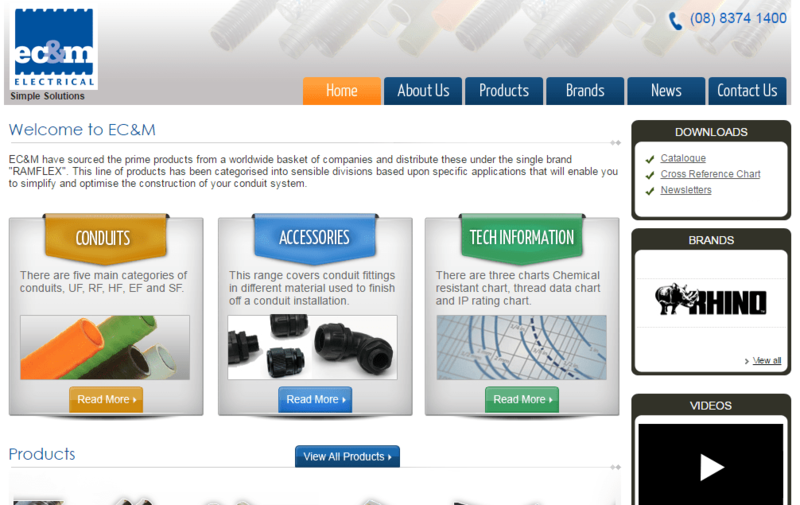 The website gives details about the variety of products that EC&M deals into. The navigability ease has made the website a success Technical specification of every product can be viewed online. Catalogue, cross reference chart and news letters can be downloaded from the website.